Drain the soaked cashews and reserve cashew water. Shell chickpeas by either 1) squeezing each between thumb and pointer finger to remove skin or 2) rolling chickpeas vigorously between a dry kitchen towel until skins peel back. Add cashews and 3 tablespoons of reserved water to a food processor and process until smooth. Add in the chickpeas, lemon juice, tahini, olive oil, and garlic and process until very smooth and creamy (this will take a few minutes, so patience is a virtue for this recipe). Add in salt and smoked paprika and pulse until incorporated. 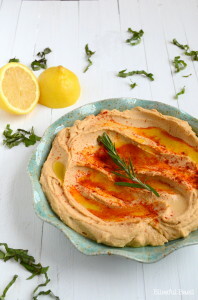 Serve hummus in a bowl and top with a drizzle of olive oil and a dash of smoked paprika.